I like to think of myself as capable of handling whatever is thrown my way. I like to think that I'm easygoing, flexible and not a control freak. I like to think that when I have a plan and set it in motion it will work out perfectly. HA HA HA HA HA!!! Are you laughing yet?! 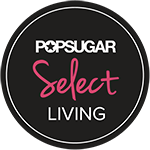 Some of you know me and most of you don't, but you might read my blog and think you have an idea of the kind of person I am. Well, I'm here to enlighten those of you who don't know me. All the things I wrote at the beginning are SO not me. I get easily flustered and stressed. I'm probably one of the least easygoing people I know. When I have a plan, I like to stick to it or it drives me crazy! We're talking lie awake at night obsessing about it kinda crazy. I'm definitely a bit of a control freak. This is what makes me.....ME! I'm not perfect, even though I wish I were, but like my Mom always said, "No one is perfect." 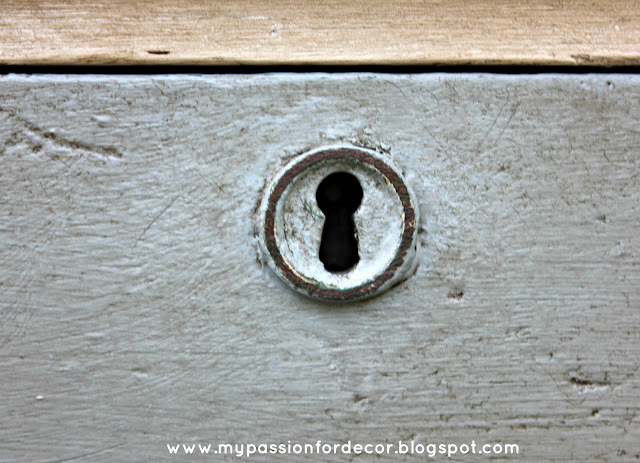 I usually have a plan and an idea in mind when I purchase a piece of furniture. I've been very lucky and my plans have usually worked out great! That was until the little green dresser that didn't want to play by my rules. 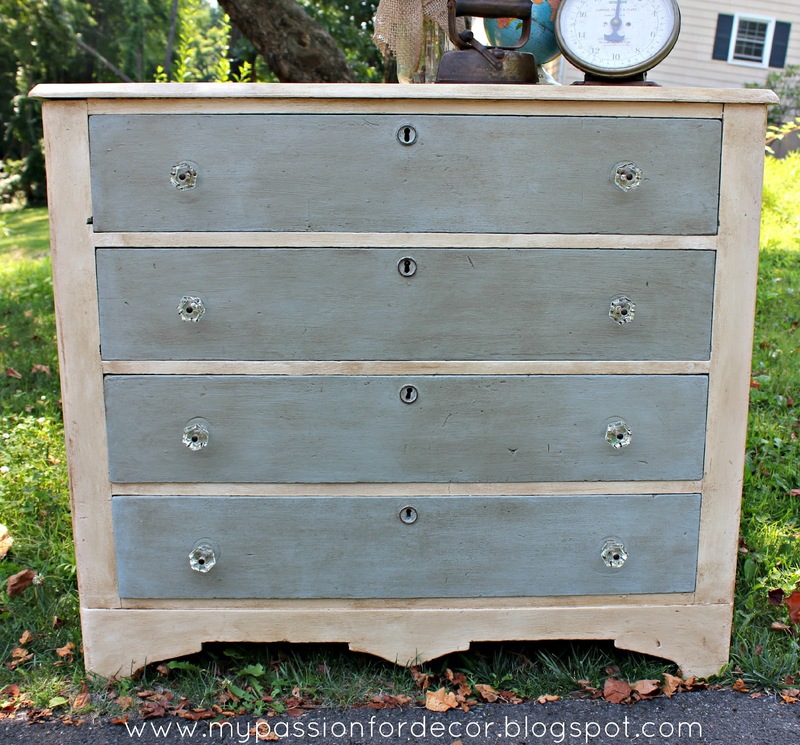 I bought this little green dresser from one of the sweetest guys! He's a very talented, young chef with impeccable taste in furniture. He's an old soul in a young man's body and has been collecting antiques for awhile. I have to quickly plug Sean's blog Homegrownmeals.com. He takes wonderful pictures of his food and has some amazing recipes...be sure to check it out! Sean's taste in furniture has changed and he's been clearing out some of his treasures on my favorite Facebook tag sale site. I've bought a few small things from him, but then fell in love with this 100 year old green dresser he was selling. My Hubby went and picked it up and I couldn't wait to get started!!! I had it all planned out and my vision was set in stone. I'm such a sucker for key holes!! 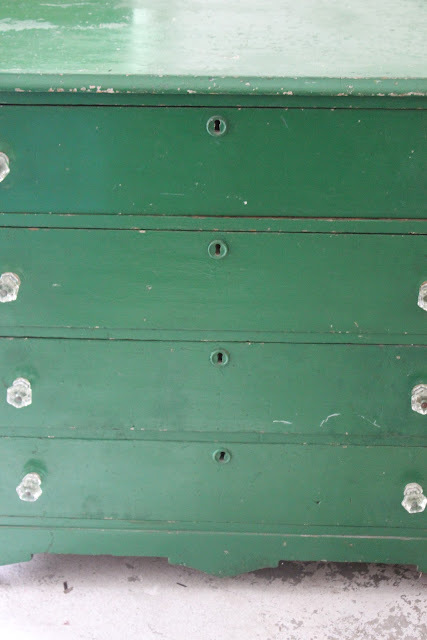 Not to mention the bottom of this dresser is incredibly charming. Like everything I work on, it was in desperate need of some TLC. It's a very old piece of furniture and has lived a very full life. 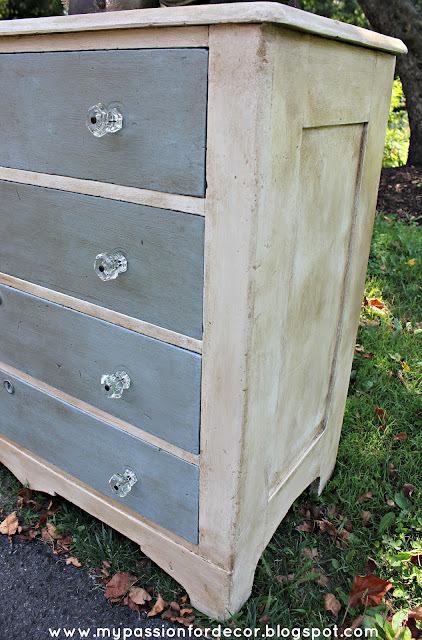 I wanted to strip and stain the top, which I try to do on every piece I can. I started stripping the top. Then after I stripped it five times, I still had residual green paint on the top. 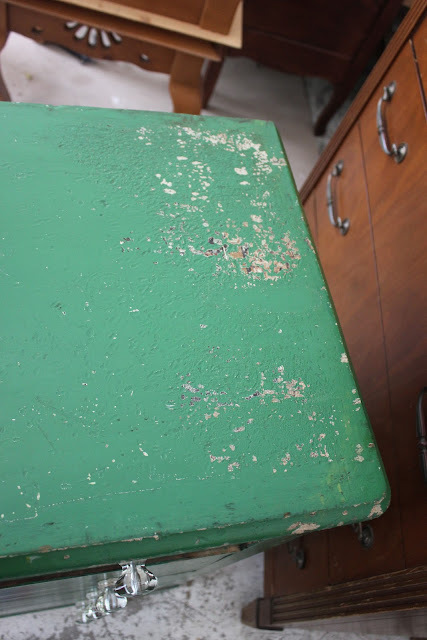 No matter what I did to the wood some of the green paint was staying put. I sanded and sanded and sanded and no luck. The top was pine, which is my least favorite wood. I did some research and realized my best route was to go as dark as possible. I made a trip to Home Depot and bought Ebony stain by Minwax. I put on my trusty pre-stain treatment and waited for it to soak in, then lightly sanded before staining. I have done this MANY times and it's always worked out great! This time was not one of those times. No matter how many coats of stain I put on, the wood wouldn't stain evenly and the knots were not covering. It looked AWFUL. Then I decided to improvise. I never stencil anything, but have been seeing a lot of people using stencils on furniture. I figured I could 'hide' the knots with a stencil. I made yet another trip, but this time to Michael's and got a great stencil for the top! 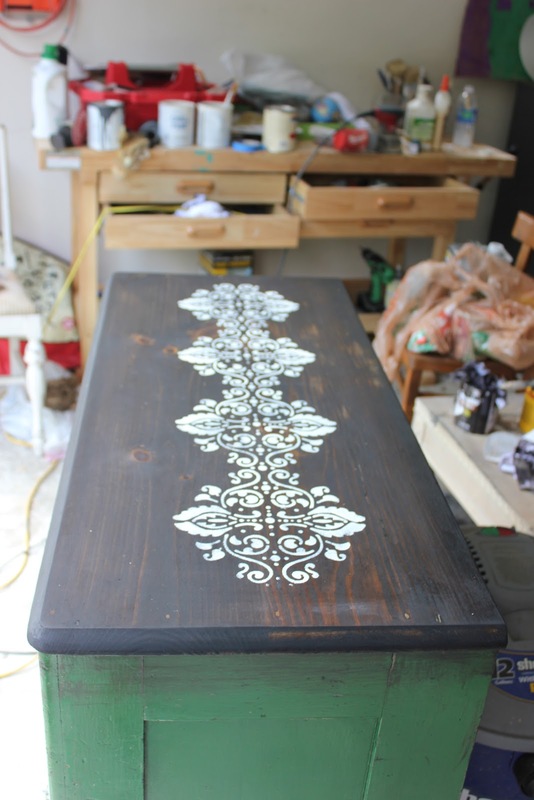 I painted the stencil on the top, then sanded it a bit and put yet another coat of stain on. I liked it OK, but it definitely wasn't what I had wanted. Here's how it looked with the stencil. There are those pesky knots!! 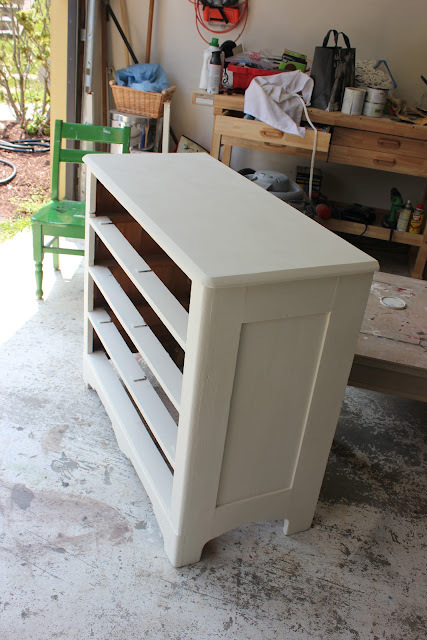 I really couldn't stand dealing with the top any further so I moved on to the next step....painting the body and drawers. 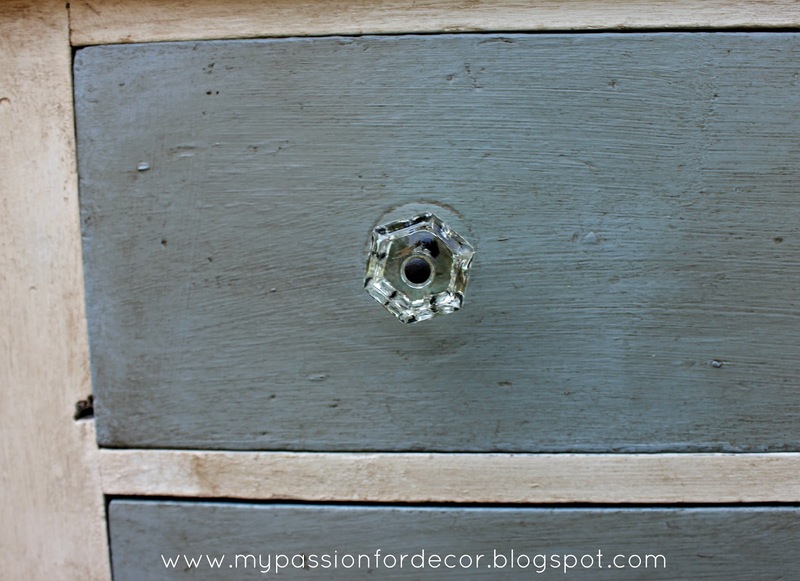 I had planned all along to use an Annie Sloan Aubusson Chalk Paint sample I'd received with my last paint order. However, I didn't want to use the paint straight out of the sample pot, I wanted to make my own color. I mixed about 1 ounce of Aubusson, with Old White and a bit of Paris Grey and I came out with a gorgeous greyish blue. 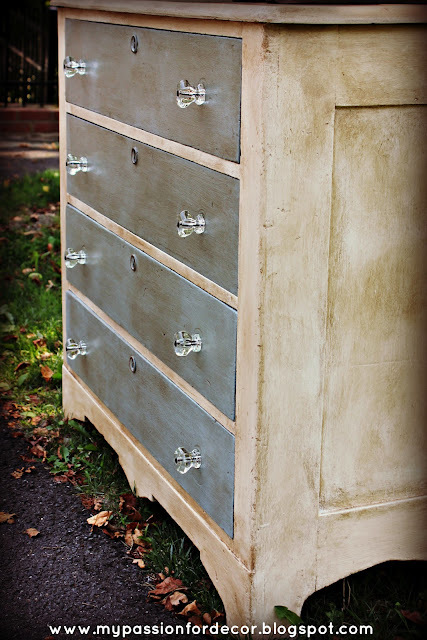 I painted this on the drawers and then decided to paint the body of the dresser in Paris Grey. In the back of my mind I kept thinking, "It really should be Old White!!!" I decided to not listen to my gut, when will I learn, and went with the grey instead. 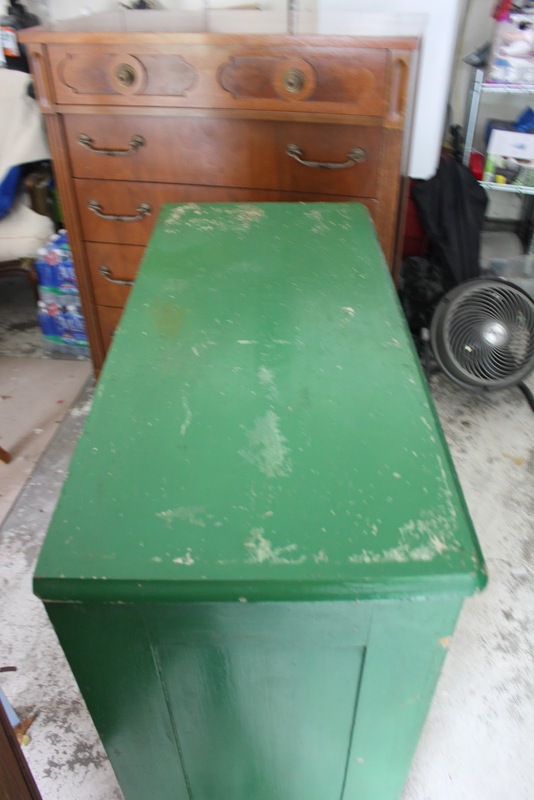 Here it is in the grey and you can see the blue drawer on the side. It was fine...yep just FINE. I wasn't thrilled with it and frankly I really hated it. When my Hubby got home I asked him what he thought and he said the same thing. I knew I had to scrap the whole plan, except I was going to keep the drawers the same because I love the color. I went for a swim with the family and cleared my head. After a quick swim and a cool down (I have to mention it's been about 100 degrees here with the humidity!) I started the body of the dresser over. I went with my gut and painted the whole thing, EVEN the top, in Old White. I have to admit it killed me. I spent a couple of hours stripping that top, but I knew it wasn't right. Here it is with a coat of Old White....Better already!! This is with 2 coats of Old White...I love the sides of this piece! 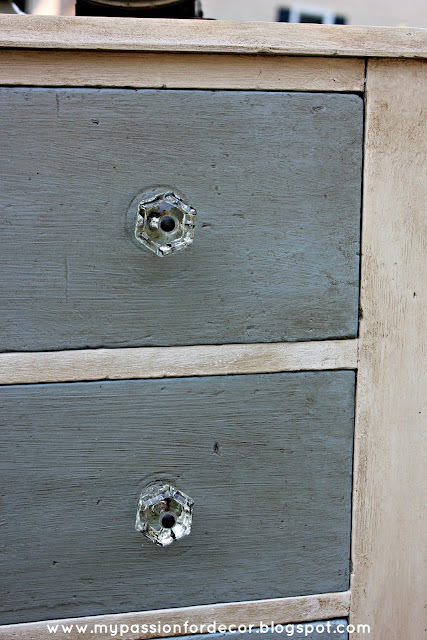 Here's one of the blue drawers with just a coat of clear wax on top. Looks nice, but flat. 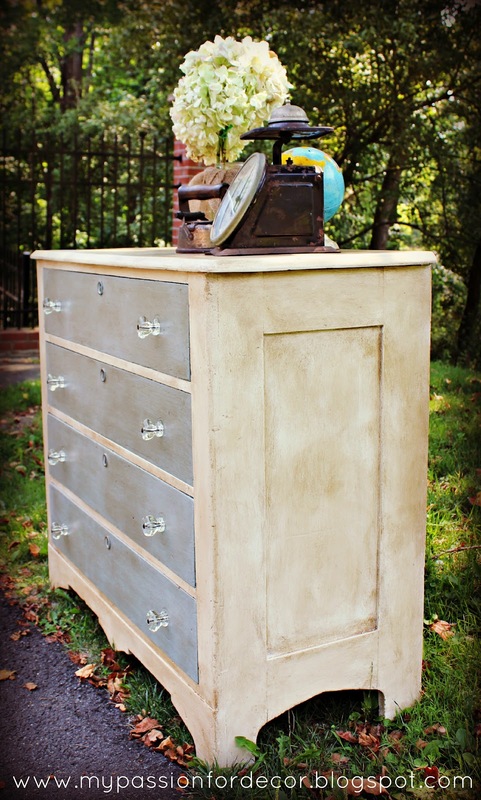 This dresser has tons of character because of it's age and it needed the dark wax on top to bring that character out. Here it is with the dark wax.....now we're talking! 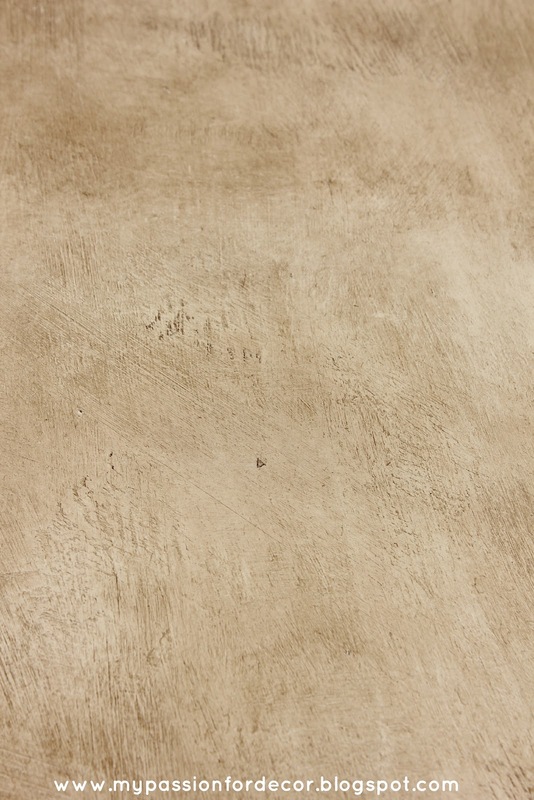 Up close you can really see all the details and character in the paint with the dark wax. Will you just look at that amazing key hole?? I slaved away for another couple of hours in the heat, determined to get this piece finished. 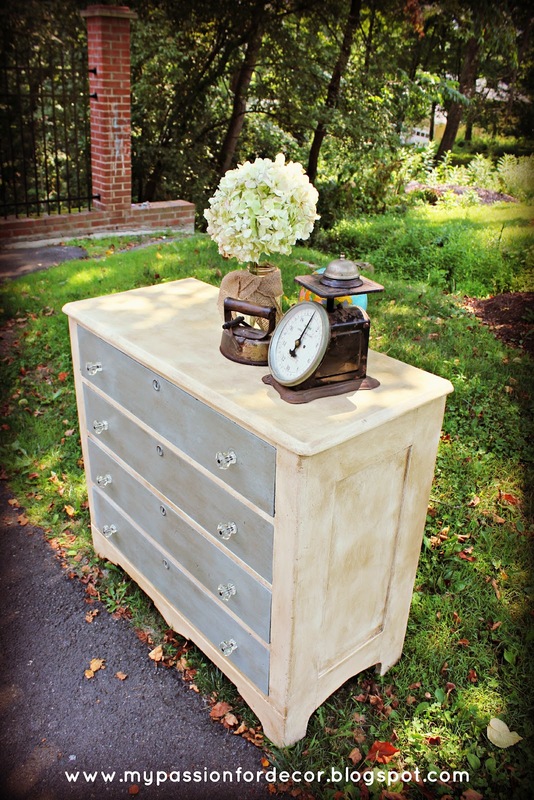 I clear waxed and then dark waxed the body of the dresser like I did with the drawers for the same reason....the character needed to come out. For the top I decided to use a technique I learned at my Annie Sloan paint workshop. I put on a very thick third coat of paint (normally I only do two, but I wanted to cover the knots in the wood) then I let it dry a bit. When it was tacky I took my brush and did a cross-hatch pattern along the top. Basically just a big X motion. I did this all over, then came back and did some more to give it more texture. I wanted the top to match the rest of the dresser. The top had lost a lot of that character when I sanded and stripped it. FINALLY....here is the finished product! I don't know if it's the fact this dresser was truly a journey for me or what, but I am in LOVE. The sides are fabulous with the dark wax. The large rectangle insert shows up so nicely. 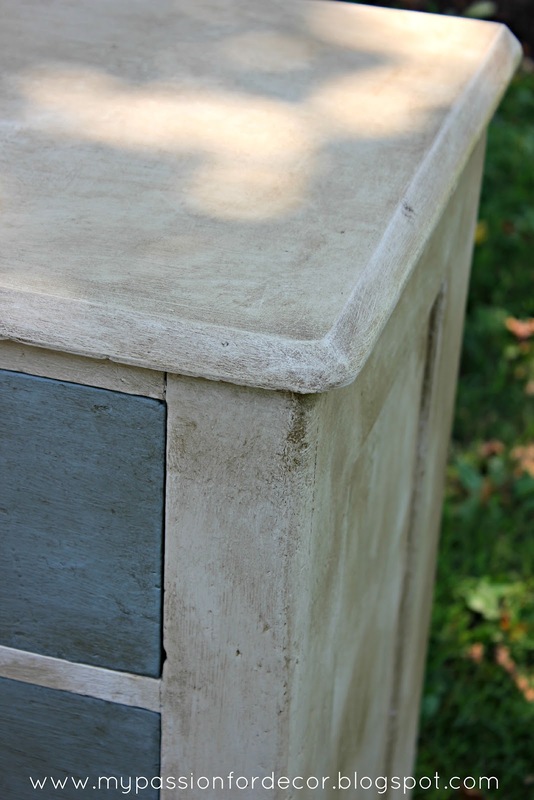 Here you can see a bit of the texture on the top and the drawers. I don't think it's possible to recreate this kind of character and age. 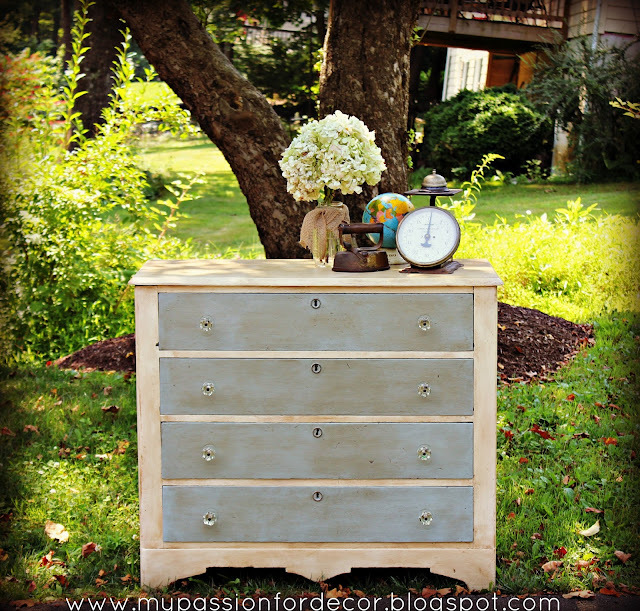 This is what a newly painted 100 year old dresser looks like! 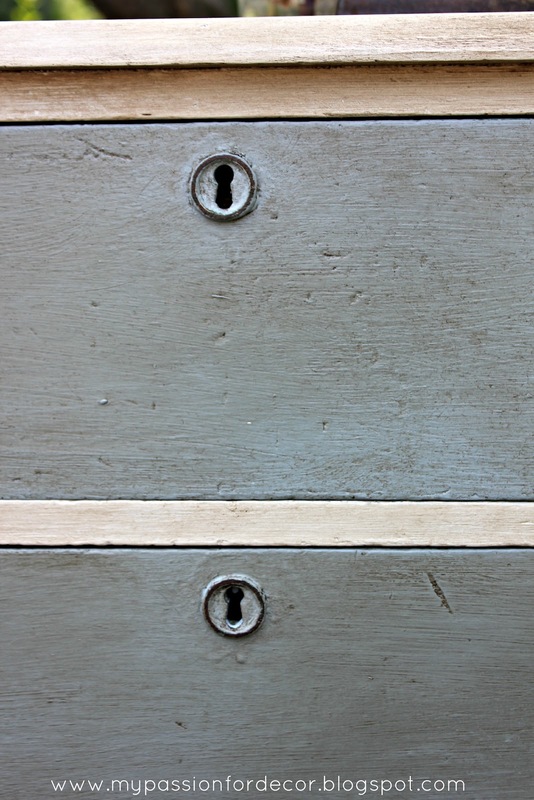 Did I mention I'm seriously in love with the key holes?? I don't know if the hardware is original to the piece, but it's OLD. I took each piece off and cleaned them and the glass has that green tinge to it. The metal screws that secure the hardware were rusting, so I gave each one a quick spray with some Oil Rubbed Bronze. It was just what they needed to update them and clean them up! It was hard to get a good picture of all the texture under the tree, so when I moved the dresser back to the garage I put it in the sun in hopes of getting a better picture. I think it turned out great! I know this was a really long blog post with tons of pictures, but I had to try and explain what happened along the way. I think every time I work on a piece of furniture I learn a lesson. This one was a much needed lesson. One of the things I love the most about working on old furniture is the challenge. This particular piece taught me to go with the flow. It's OK if a plan changes and it's OK if something doesn't work out the way I thought it would. It's all changeable and that's part of the fun!! Ha!!! 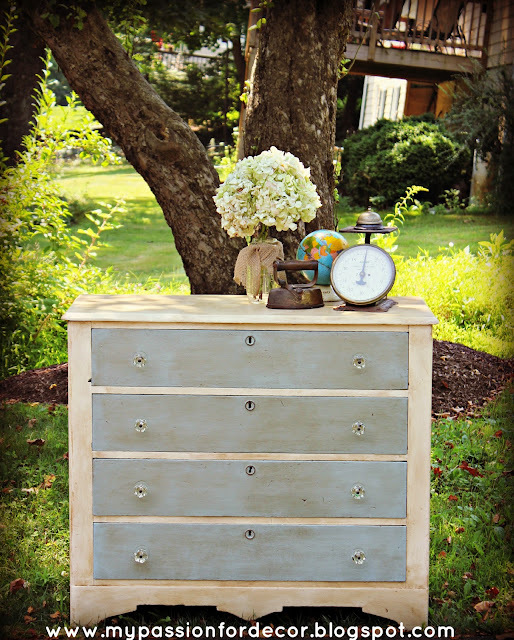 I had a dresser like this months ago. It was so hard to work with that I don't even want to look at it anymore. It is lovely though... I love that you documented the journey. It turned out great but I bet you are really wanting to see it go to a new home. I cannot believe this is the same dresser I've had for years. I KNEW deep down it could look that good. It has such good bones. I absolutely adore what you did and you respect in updating it but keeping it old world. I love it. 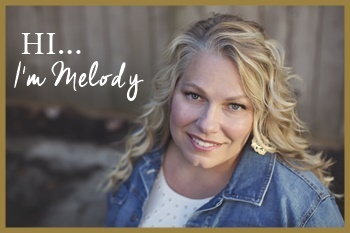 Thank you Melody. This made my day. I can't wait to see the rest! I think your Plan B worked out well - sometimes a challenge leads us to a better end result. That has happened to me so many times. Like the table I refinished. I intended to sand and stain the top, but after I stained it, it was mottled and I could not fix it so plan B was paint with stain on top. I loved how it came out although I never would have tried it that way! Great job - really a cute piece! Still too HOT here to work on projects. 106 today. Again tomorrow. Brutal. Can't wait to find some days to get to it! Thanks for the inspiration!! I love the end result! Wonderful choices! I really like the close up photos, I almost can feel the texture... Great Job! I found your blog from miss mustard seeds link party and love reading your posts! Thanks for your insight into each peice. I just painted a desk with Annie sloan chalk paint in old white, first time user. 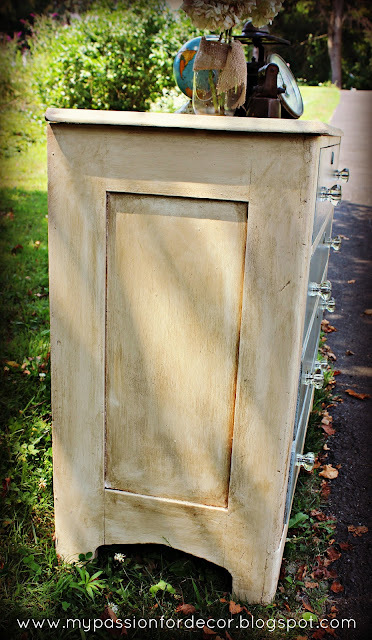 I gave it a coat of clear wax and wondering if I can give it a bit of character with valspar's antiquing glaze since I don't have the dark wax, what do you think? 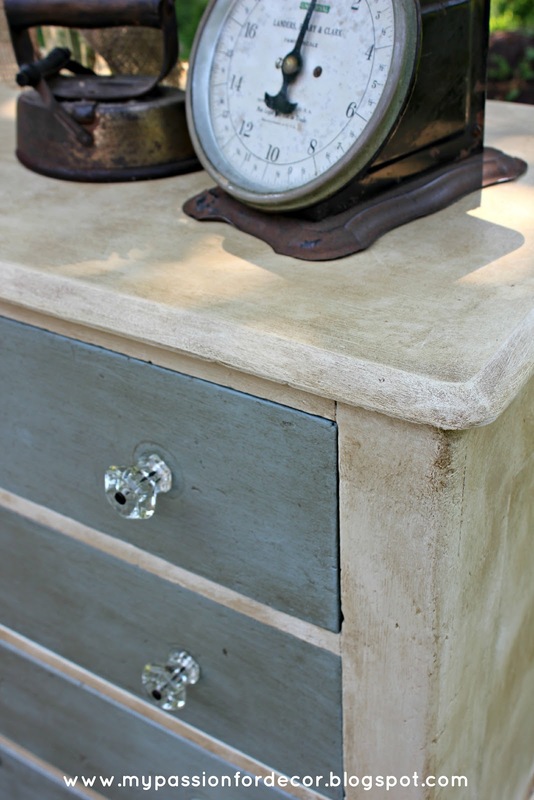 The knobs are a nice added touch. Your work is beautiful. Are you selling is piece ? What are you asking and what are the dimensions? Laurie, can you email me at mypassionfordecor@gmail.com?? Then I can give you all the details. Hi Melody! I just discovered your blog and have spent the last couple of days just soaking in all your beautiful furniture redos. I LOVE it! I am a total novice when it comes to giving old furniture new life, so I have been scouring your site on how to do basic things, like properly stripping paint, sanding, painting, properly waxing...basically your whole process, since you are AMAZING at it! I know you have a link on your blog about what paint you use (yay Annie Sloan! ), but I know there would be a lot of people who would benefit if you did some sort of "How To" link on your blog about how to properly revamp old furniture.